Pretty much like I imagined it! version in our friends’ Parisian apartment. Read more about our Delightful Dinner in a Parisian Home here. A good friend got this green and white fabric on sale for me! It’s heavy linen by Raoul Textiles . (yep, they are just taking a little breather until Fall). For now, I am enjoying this celery and salmon colored look (sounds like dinner). 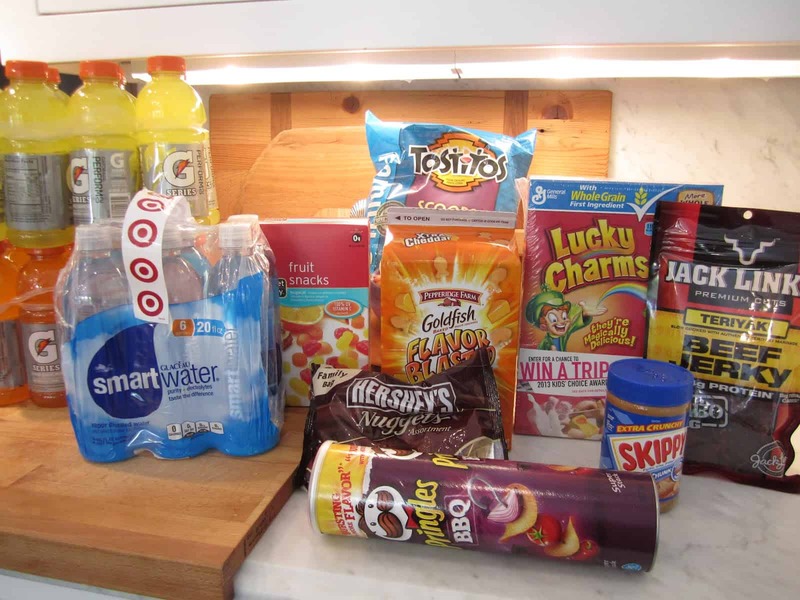 What is all this junk from Target doing on my kitchen counter? (and he’s been on the opposite coast). Just stocking a few of his favorite things. It’s been nice having a clean house the last several months…oh well, that will change. Sweet blog commenter, “Linda in AZ” sent me this linen pillow. on the coffee table smells divine. It’s new from Home Goods and at $16, it’s half the price of what it is on Amazon.com. I should get a couple more (if they are still there) for hostess gifts. The chandelier looks incredible!!! So perfect in your living room! 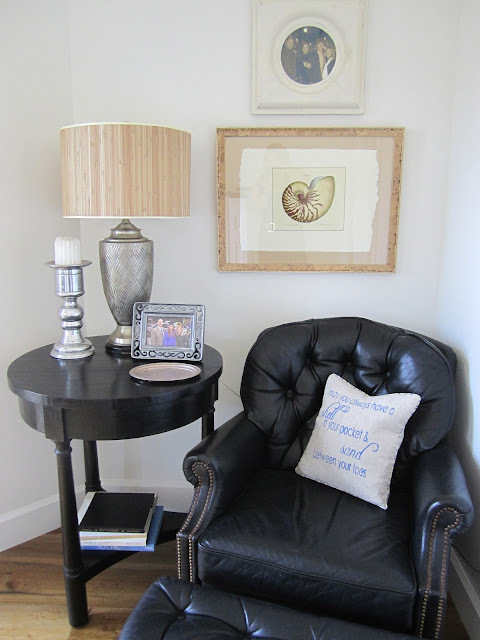 I second Marianne's sentiments…that chandy is simply stunning and looks amazing in your beautiful living room! The chandelier is perfect! I love your spring / summer look – very fresh and "pretty"! I really enjoy your home. I have fond memories of Newport Beach, and your blog always takes me back. A former neighbor of mine lives there (her name is Ann Janes), and I visited her a couple of times years ago, but we have lost touch. Then two years ago when I bicycled from Portland headed south, we ended our three-week ride in Newport Beach. I was so glad to get there. Absolutely perfect. Love the whole room and how sweet of Linda to send you that wonderful pillow. Where is the chandy from? It's from Arteriors. Looks nice at night, too. Unbelievable Maryann… it has really elevated the entire space!!! Enjoy both it and your boy!!!! My boy is staying in Westwood for the summer and commuting to Simi Valley for an amazing internship. I'm so proud yet envious that you will have yours home for the summer. Beautiful! I love the chandelier, it looks fabulous! And the new fabric! What a beautiful summer look. Just when I thought a space couldn't get any better… The chandelier is just fab. And what a good momma you are. My little boy likes those same snacks and while he's limited now, I'm going to make sure the pantry stays stocked through hs and college. Sometimes it's the little things… Like pringles and gatorade. Gorgeous, Mary Ann. I knew that it would look fabulous. My daughter comes home a week from Saturday. Will be glass to have her home to spoil! What a beautiful statement piece! I wouldn't have thought that room needed a single thing, but it's the perfect addition, so much interest! Love your special treats! Always love seeing what you have done. The whole room is absolutely beautiful! Thanks for sharing. Love the chandelier too! Your room is so beautiful and airy!!! My son is coming home from college too so I will also have to buy him things that I usually don't have around the house. Love it! What a great choice. I love that chandelier. So pretty! What a pretty new look for your living room – the chandy and the new fabric and accessories! How fun. And enjoy your son being home – must be exciting!!! 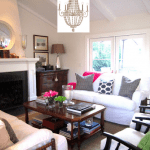 As usual, I love this space of yours Mary Ann, and the chandelier is so fabulous!! The pinks and greens look great in that space – I love how you can change it up because the floors & walls are so neutral. Enjoy your son at home for the summer! Fabulous choice – looks fantastic. 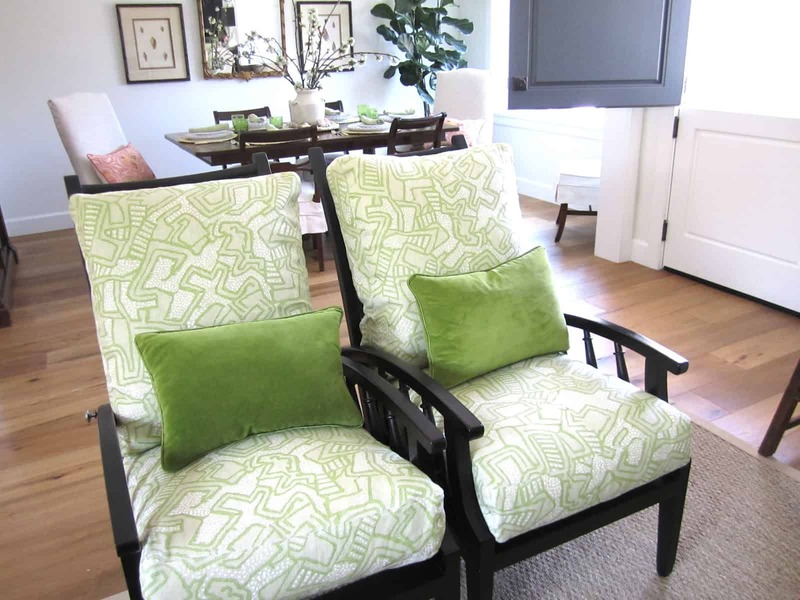 I love the green & white fabric on the chairs – could use a pair of those myself. Your living room is gorgeous for summer… so light and airy! The salmon and celery green are perfect together. Love the chandelier, too! 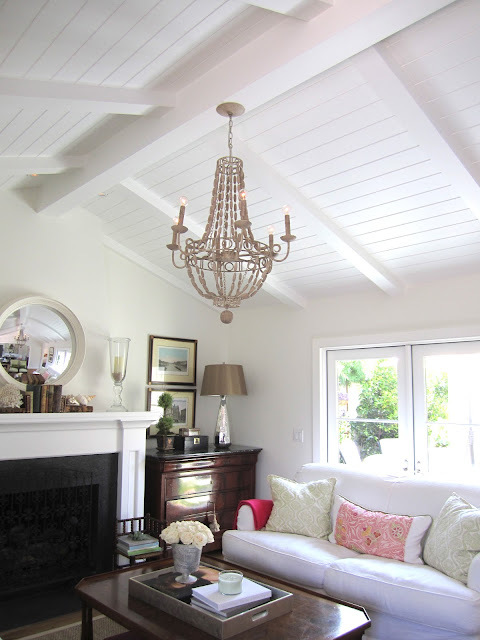 Your living room looks gorgeous and definitely ready for spring, and the chandelier is perfect! I'm jealous of your ceilings! It couldn't be more perfect! Just the right proportion and style for the room. I also love your new chair covers, the whole room looks so bright and cheery and I love the green and pink combo. Springing into summer….just delightful!!! Or I should say…. "celery and salmon" combo!!! Love the chandelier! Couldn't be more perfect. Just the right touch of California casual with a French influence. Have fun with your son home this summer! My daughter is coming home this weekend, then it's back for summer school. It's best for all of us! Love the new chandy! It's perfect! The new chair covers are such a fresh spot of color! Thanks for sharing. Love the new chandelier. It adds another great touch to your room. I am also in love with your dutch door. Looks gorgeous as does the rest of your Summery living room! Just looking at your ceiling – the painted white paneling adds, so much character to the room, I'd love to do something similar. Love it all! I love it. I was a little worried about the scale when you showed the pictures yesterday, but it is so perfect. I also love the new color accents. I was so pleased when I discovered your blog. 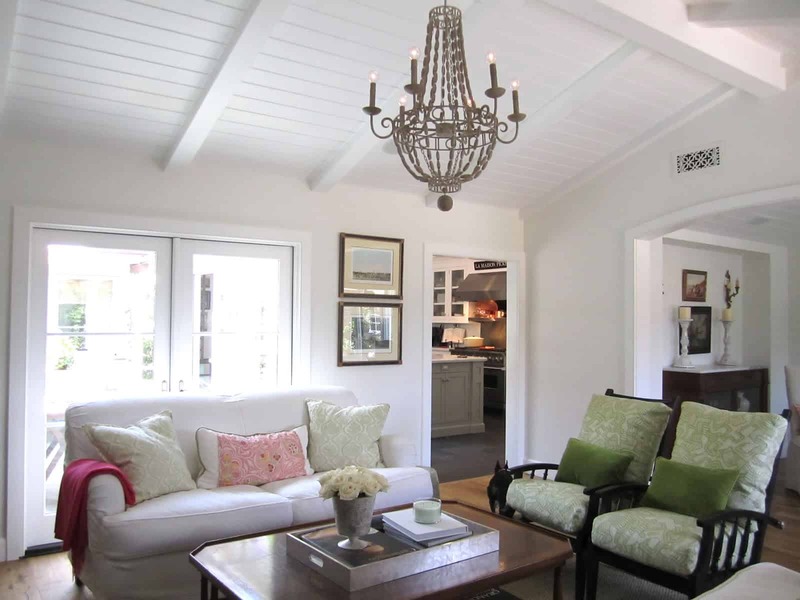 It fills a real gap for those of us who have older, classic houses without massive rooms and love a dash of color. Love the grey, Swedish look in someone else's house, but I still have the same walnut dining table that I bought almost 40 years ago when I got my first job. If I love it, I keep it. Are you kidding me, this is drop dead gorgeous!!!! Just love everything about this room. Thanks for linking up. Love the room fresh and clean looking !! My son is home this weekend from college too !! Stocking up on food and laying down a few house rules !!! #1 rule is: this is my house so keep it my clean not your clean!! lol !!! ENJOY ! I love the living room and the new chandelier. The summer fabric on the chairs is so pretty! I just sent my college son a box of stuff that looked remarkably like what you bought for yours. 🙂 Enjoy your time with him! I am completely obsessed, Mary Ann…your chandelier is fabulous!! 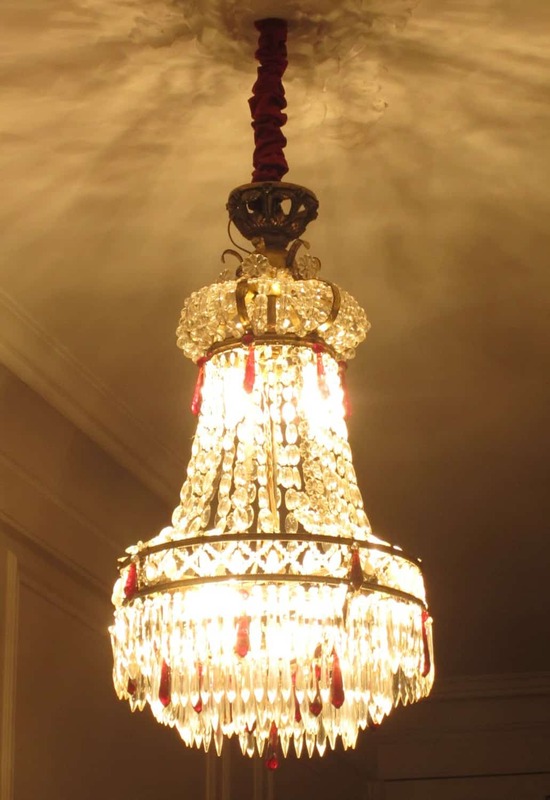 Is it wrong to covet thy blog friend's new chandelier? This room looks so elegant and comfortable. The chandelier is beautiful! Your living room is so pretty. I love how you are all prepared for your son's homecoming! 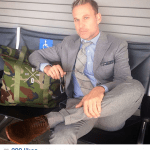 I am giggling at the above comments….I am coveting the whole dang room! Had to laugh about the comment about your son coming home and a clean house. One of my daughters came home last week and our house looks like a bomb hit it! After seeing her dorm room when we picked her up, I now can see why. Mary Anne your living looks so fresh and like Springtime. Adore the Chandelier; did you say where you found it? Ha! I remember the days I was buying all of those snacks for the teenagers!! love the new chandy and the new fabrics! so cute!! linda sent you a present? lucky you!!!! I love that you change out your cushion covers on those chairs! That is so fun! I also love all the white in your place, makes it easy to switch things up for different seasons, fun. Your new Chandy is perfect… It is the finishing touch!. It is hard to imagine you didn't have this before! It must be so pretty at night lighting the room.. The chandelier was the perfect choice, cannot imagine anything looking better. Well done! Love the feeling of the fresh green and white fabric too, so pretty and clean and crisp! And I can relate to all the "healthy foods" you displayed for your son coming home..its fun to indulge a bit as a homecoming perk! 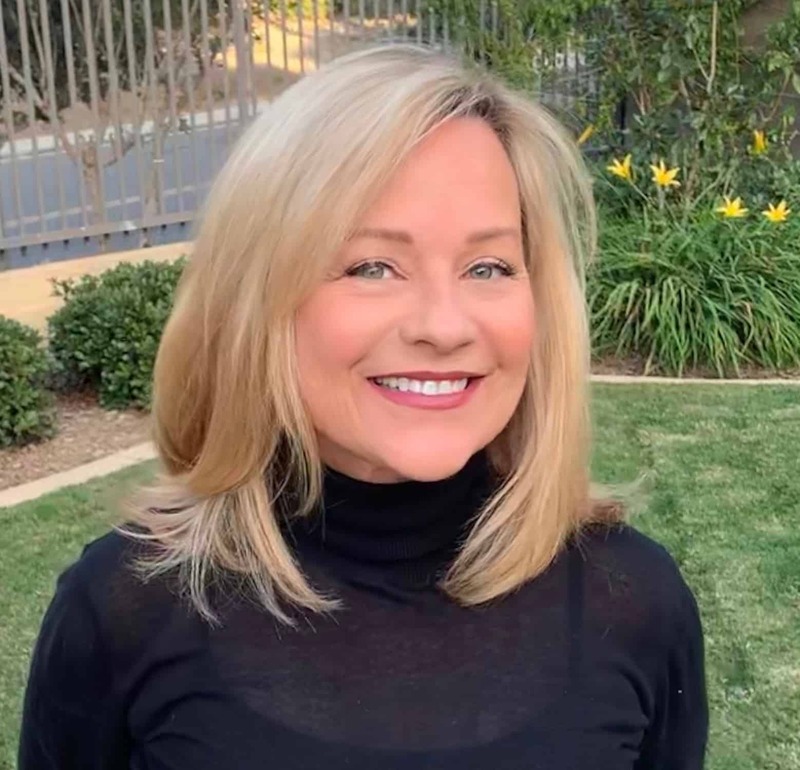 Enjoy his visit, the extra laundry, the late nights, the food bills sure to triple,etc…….love when all my kids are home too:) Have a great day Mary Ann! Great fixture and room overall! It compliments everything else very well. I actually like it better than the Baccarat fixture. Sure saying Baccarat sounds more expensive, but that doesnt mean it does anything more for the space but it does leave more money for junk food! Boy can I relate! My son is on the West coast in school and I am on the East. Twice a year, I would go into debt buying junk food for his trips home! I remember being so lost when he left for college so far away. I realized this past Christmas would be our last extended time together. I leave tomorrow for LA to watch my son graduate and commission in the army. No more long Christmas breaks or summers! The fact that they went so far away for college is indicative of what strong independent children we have raised. It is especially amazing considering how poorly we fed them! Enjoy indulging him! Your chandelier is beautiful. I think its the perfect finishing touch to your room. Enjoy having your son home from college! The chandelier looks wonderful in your room, I love your ceiling. 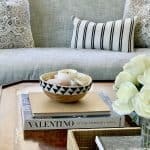 I'm a huge fan of small changes for the season and your green and white with the green throw and pillow look so spring/summer fresh and inviting. I really like the chandelier over your dining table as well. I would say the new chandelier is just about perfect. I am fairly new to your blog. Love the chandelier and love your home. It is just like a burst of sunshine! You are very talented. *** Yessireebob, that chandelier P*E*R*F*E*C*T*L*Y says "Mary Ann" (!) … what a relatively "UNEXPECTED DELIGHT", sooo befitting your yummy house at the beach!!! 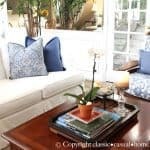 Annnd, the slipcovers & pillows are so summery, happily "lighthearted" & oh-so-pretty!!! ~ (I love a "change" & do it several times a year too, depending on the season), even when I DO love the way a space usually looks!!! Casual elegance! It looks fantastic! And, I love the new green fabric you have incorporated for summer! So fresh and cheery! I love your blog and my taste is right up your alley! I'm a Dallas girl trying to get to Cali someday…. (my cousin lives very close to you in Emerald Bay and I'm in LOVE with that area!) 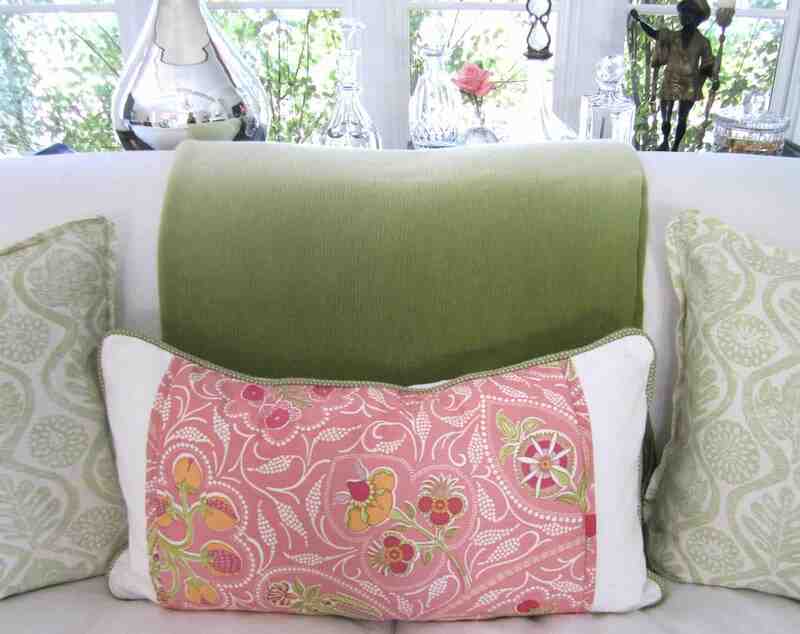 I love your green and white pillows on your sofa…who makes the fabric and do you think it's still available? Thanks so much! Hi Jaye… the linen fabric is from Lee Jofa…handprinted in England by Blithfield & Company. I believe the pattern is Oak Leaf. It was kind of expensive but good quality. It looks FABULOUS. I so love it. It looks beautiful. I love the new summer fabric on your chairs too. The room is so serene and inviting. 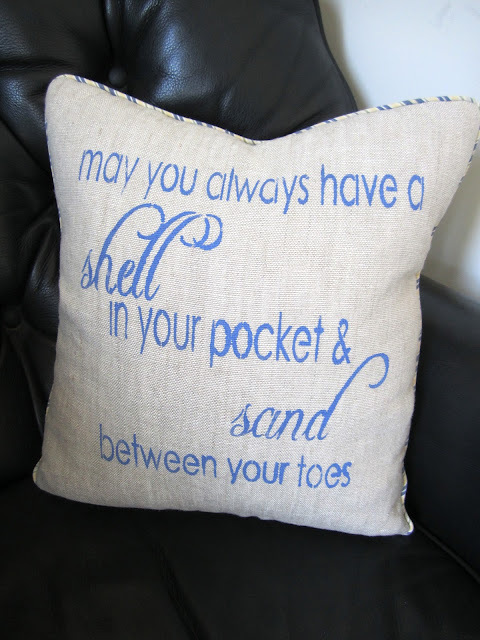 I'm envisioning my kids leaving footprints on your lovely sofa! Maybe someday I'll have a light sofa. Your living room is so pretty! Love the new light and the color combo is gorge! Honestly, it could not be more perfect!!! Love it! Hi Mary Ann, what a gorgeous, gorgeous room! Everything is so comfortable and lovely. The chandelier just makes such a wonderful statement on that fabulous ceiling! Thanks so much for linking up to VIF! The chandelier is like the crowning touch on a beautiful room. I would love to see it at night! This room is perfect. Just looking thru the pictures reminds me of the beach. The chandelier is stunning, and the fabric on the chairs is outstanding. Your living room is just beautiful! Can I live with you? Oh my your home is beautiful! Love the door and everything else! Hi Mary Ann! Your new chandy is gorgeous!! I love the new fabric and the color is wonderful. Thanks for linking to the Open House party. Congratulations on being featured on Tuesdays Treasures! I'm your newest follower! How gorgeous! Love your home! I also have a college kid that eats like that! Sooo gorgeous!! I love that chandelier and your living room~ beautiful! Thanks for linking up at Feathered Nest Friday! Beautiful room! and the chandy is perfect for it. Little Bit from http://www.DecorateWithaLittleBit.com p.s. I'm going to find a way to follow you… LF or FB… hope you'll come visit me too. This room is gorgeous!! Thought I was looking at a picture from a magazine!! now following you via GFC…you are so inspiring, can't wait to see more! You´Ve got a new follower! You home looks so comfy. I recently found the Calvin Klein Leaf candle. It is simply divine!